World Rivers Day took place on 24th September 2017 and to mark this day we visited Parteen Regulating Weir to take some aerial photos. The ESB abstract up 400 tonnes of water per second (cumecs) from the Lower River Shannon Special Area of Conservation (SAC) at this location reducing the flow in this Natura 2000 river downstream of here to just 10 cumecs. The implications of this unsustainable abstraction has never been assessed under the EU Water Framework or Habitats Directives. This weir blocks the upstream migrations of Atlantic salmon, Sea Lampreys and River Lampreys – all which are all qualifying interests of the SAC. It also blocks access for the critically endangered European eel to the rich Shannon catchment – an internationally important habitat for this species. 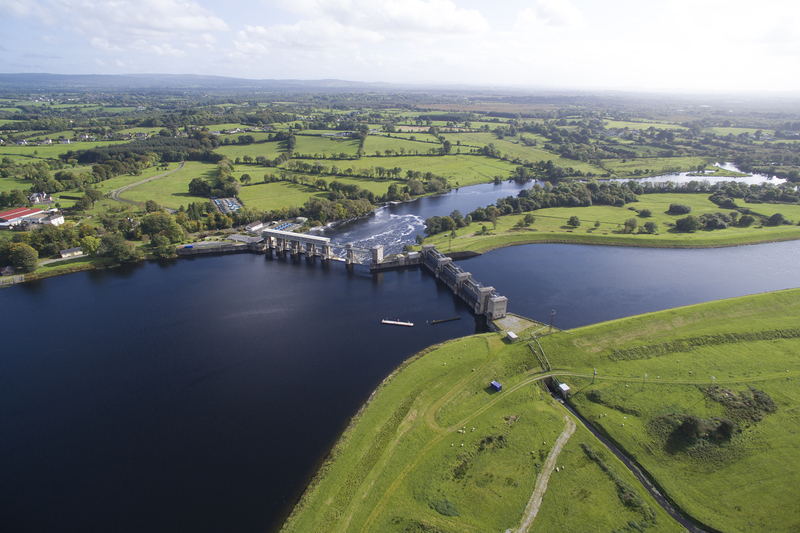 Downstream migrations of smolts and silver eels are diverted here – along with the water – to Ardnacrusha Hydroelectric Station. All fish migrating downstream go through the turbines as there is no downstream fish pass. The ESB has made no effective progress in addressing the major ecological impact of the Shannon scheme. Currently the escapement of salmon past the Shannon dams is <5% of the conservation escapement target and the salmon and #eel fisheries are now gone. There urgently needs to be independent monitoring of the fisheries activities of this commercial company – something that Inland Fisheries Ireland have failed to provide. The technology and knowledge is there to solve all these issues on the River Shannon but the ESB have obstructed all progress here. Rather than upgrade their elver trap this year they chose instead to install a major boom to block boats entering the upper tailrace to avoid scrutiny. Inland Fisheries Ireland banned salmon and eel fishing to assist them in severing the connection of local communities with the river, in advance of progressing another major water abstraction scheme at this site. These things need to be said again and highlighted on #WorldRiversDay! Thanks for highlighting the damage to the fisheries. It’s shameful what the esb have allowed to happen on the Shannon, and the erne, the Lee, the liffey, and the clady rivers.